So, looking at that map, it seems like we can solve a lot of world hunger issues... Just provide those countries with more whiskey, vodka, tequila, rum, gin, and brandy! AND you put the screech where it belongs! My highest praise. Any interest in pinning our locations? We're thinking about do this with a large wall map at our office, 1 pin per client. I thought that someone set up a "pinnable" map once of Axiom owners... I wonder if that still exists. I fondly(?) remember Screech from my posting in Gander, Nfld in the 1980s. 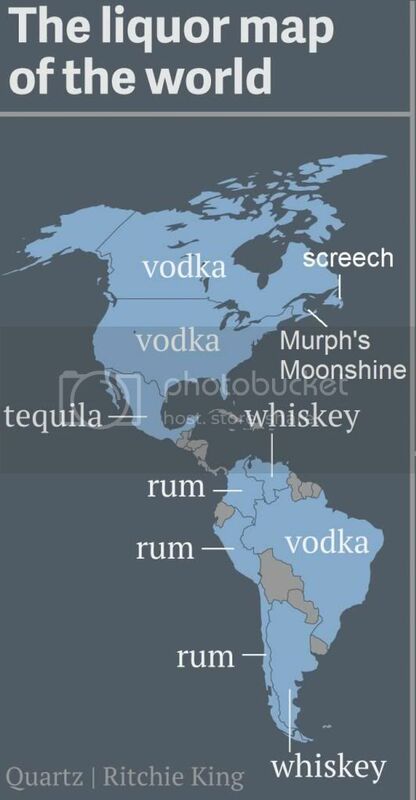 Have to say I'm surprised that whiskey isn't the most popular in Canada (or the US). Half mug ice, 2 ounces whiskey, fill the mug with 7.